On 7 September, Southern Mexico was struck by a powerful 8.2-magnitude earthquake. Indigenous communities in Oaxaca and Chiapas, Mexico’s poorest states, were hit hardest by the disaster. Around a hundred thousand families lost their homes. The worst devastation happened in the Isthmus of Tehuantepec, an indigenous region where according to official figures, 50’000 homes were destroyed or badly damaged. On 19 September, a second earthquake devastated more indigenous communities in Morelos, Puebla and Guerrero, as well as Mexico City and other cities. The death toll is still unknown. Communities in remote mountain regions near the epicenter are receiving little attention amidst the massive destruction and numerous casualties in urban centers. The Isthmus has a world-class wind resource, wind farms totaling more than 2’000 MW were installed there during this decade. However, indigenous communities have not yet been included in wind power development in their territory. Most families remain in poverty. 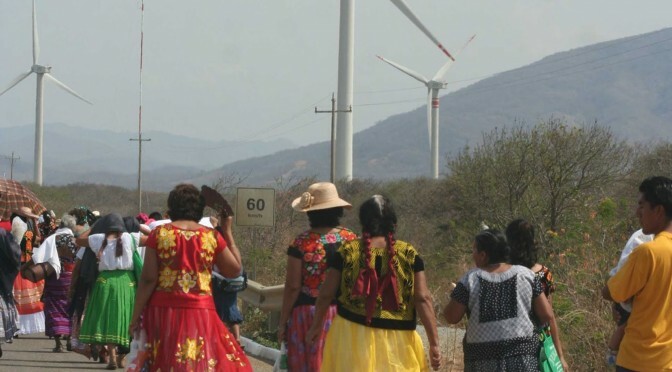 Yansa and the World Wind Energy Association want to set up, together with local organizations, a small wind farm to fund community-led reconstruction in rural indigenous communities devastated by the earthquakes of 7 and 19 September. This will nurture the autonomy and leadership of these communities, reducing their dependency and vulnerability. We seek companies, in particular wind turbine manufacturers, ready to donate part or all of the equipment required for this project. Our first priority is to identify manufacturers willing to donate wind turbines in the 1.5-3.5 MW range. Financial donations for construction and commissioning will also be welcome. In-kind and cash donations may be tax-deductible. This project will serve as model for community participation in wind energy in developing / emerging countries. After the reconstruction process is over, profits will be devoted to community-led reforestation. More information can be found here: Community_wind_and_post-earthquake_reconstruction.